Transformation is one of my most deeply held values. I believe that our purpose for being is to awaken to a higher level of consciousness in order to transform our human experience. I have lived this value in my own life, and have discovered that one of my personal Spirit-gifts is the ability to help facilitate this process in others. I am an author, speaker, and workshop presenter. I have published numerous articles and my first book was recently published and is available on Amazon. I have presented workshops and spoken in churches, in the corporate world, and at regional, national and international conferences. I love teaching. It is my passion, my heart, and my gift. I first realized it over 25 years ago when I began tutoring fellow students in college. During my 20 year career in the corporate world, I developed curriculum and taught classes in companies all over the United States, the United Kingdom, France, Denmark, the Netherlands and Panama. I also presented papers at a number of international conferences in the United States. I am now creating curricula for and teaching classes related to spiritual growth. As a dedicated lifelong learner myself, I have a Bachelor of Music degree from Emporia State University and a Bachelor of Science degree in Computer Science from the University of Missouri in Kansas City, in addition to a Master of Divinity degree from Unity Institute. I also have a deep passion for music. The first time I sang on the stage, I was five years old, and I have been going strong ever since. When I sing, I feel God moving in me. When I compose, I feel the creative energy of God expressing through me. I have directed a number of choirs over the years and was music director at Unity Church of Independence before heading off to seminary. 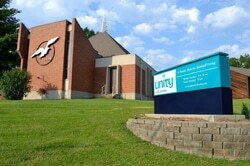 I am an ordained Unity minister, serving as the senior minister at Unity of Columbia, MO. I have also served as served as the senior minister at Unity of Bloomington, IN for five years (2010-2015) and as the president of the board of Unity Worldwide Ministries Great Lakes Region. My international background has given me a deep appreciation for diversity and for the universal Truths that can be found in other faith traditions of the world as well as in our Unity teachings. I have extensive training in spiritual counseling and conflict resolution including: Pastoral Counseling, Lombard Mennonite Mediation Skills Training, Peacemaking Skills, BePeace Foundation, ‘I’ of the Storm, and Thriving Ministries. I am a student of Integral Theory and have been certified in Spiral Dynamics Levels I and II. I am deeply interested in applying our Unity teachings to the areas of self awareness, self acceptance, forgiveness, and shadow work.